The HETS office wants to congratulate Dr. Ricardo Fernández, Lehman College President, for his recent achievement, the receipt of the NFL Hispanic Heritage Award. Lehman College is one of the HETS founding members that initiated the Consortium in 1993. Dr. Fernández has been part of the HETS Board of Directors ever since. 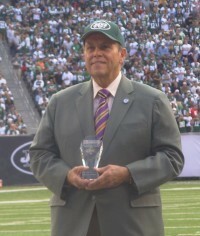 BRONX, N.Y. — Lehman College President Ricardo R. Fernández received the NFL Hispanic Heritage Leadership Award on Sept. 18 during the Jets game against the Jacksonville Jaguars at MetLife Stadium. The Jets went on to win the game, 32-3. The award to President Fernández was given in recognition of his 21 years of service at Lehman College and his long-time leadership and advocacy in his community. He is the longest-serving of the 23 current CUNY presidents. The NFL and the Hispanic Heritage Foundation partnered to launch the NFL Hispanic Heritage Leadership Awards during the 2011 celebration of Hispanic Heritage Month. The awards recognize the contributions of Hispanic leaders in each NFL market. The day launched a league-wide celebration of Hispanic Heritage Month (September 15– October 15, 2011) and included a variety of cultural entertainment, performances, and activities that reflect the diversity of New York’s Latino population, the second largest in the country.